@Amour256 wrote: Are you guys talking about episode 53? Subbed version out already? No, the raw version. No English, no subs. Still, it's the only way to get some of the visual hints early, so we just tend to deal with it. Also is it just me or has Ash's and Serena's relationship become a very important, inseparable part of this series? It feels like....XY won't be XY without them! It just won't be XY without Serena and Ash's and Serena's relationship! It almost feels like it is a core part of the series. Inseparable and cannot be ignored. Just like....XY won't just be XY without them! Also....as far as I hace noticed.....is Serena getting the most importance out of all the Pokégirls uptil now? Hey all, so I see we have a new thread. A real shame the old one had to be taken down, but frankly I do see the point that mod was making. Things were getting off-topic quite a bit, there were quite a few one-liners and in general the posts seemed to become less focused/coherent, and the attitude in general seemed to shift toward growing the page count. While 1,000 pages is a nice milestone and all, I think we should all aspire to make sure that in this thread we make post quality, and not post quantity, of first and foremost importance. Thanks to PotSmuggle for making this new thread, and I hope it goes well. @ScienceIsSoAmazing wrote: Hey all, so I see we have a new thread. A real shame the old one had to be taken down, but frankly I do see the point that mod was making. Things were getting off-topic quite a bit, there were quite a few one-liners and in general the posts seemed to become less focused/coherent, and the attitude in general seemed to shift toward growing the page count. While 1,000 pages is a nice milestone and all, I think we should all aspire to make sure that in this thread we make post quality, and not post quantity, of first and foremost importance. Thanks to PotSmuggle for making this new thread, and I hope it goes well. Look at my previous posts. That's pretty much what we know so far. I really don't see much happening shippingwise until maybe XY59, but I don't think it'll be anything really big, probably some great character interactions though. I hope we get some new info. on the episode soon. *Whistles in amusement* You did a great job cleaning up the thread while I was gone Blood Red. Good work! I'm going to look into what kinds of forums and categories should be added on these boards. I aim to make this forum also compatible to multi-shippers because the vast majority of AmourShippers came from their previous ships, so I want them to enjoy that too. I’m going to check out XY053 now. Keep up the good work everyone. What the heck guys? I was gone for a few hours (to sleep) and three pages?! Slow down! WHAT?! WHATWHATWHAT?! Hint confirmed! I don't believe she did that! And you people called this a desert? Btw, I received a massive infraction. Massive. In Serebii :p Fools. They think they can stop me with that? I can just make a new acc! And they called this forum as "small" guys..:p And cited the same old thing. It was going off-topic, blah, blah blah..
@matthew11 wrote: I'm a stalker lol not. Actually, I was roaming around to check some news about us on Serebii. And yeah, some users sure are bitter when it comes to us amourshippers. Huh? Someone was talking about this place on Serebii? Weird. X: Hey there Mal, so I see you're not the only one who thinks some Amourshippers are odd, eh? Y: or are watching the wrong show if that's what they are after. X: You're not the only one who feels that way, I look at my old posts and just hate the guy who made them. Yes, you have no idea how much they annoy me now. X: The AmourShippers have finally cracked me, their stupidity and idiocy knows no boundaries. Help Meeee. Y: What posts are you referring to? X: Everything, their obsession over this unlikely pairing, their obsession with watching the dub to complain about toned down hints, etc. Please, troll them for the sake of my sanity, please! Y: I know Yordel is straight up trolling, but not sure if others in that thread are too or actually serious..
X: So did you hear about the AmourShipping thread being shut down? I'm extremely happy, and this is coming from someone who actually likes the ship as well. Y: Yeah, I saw. Not surprised. That thread became too weird and intense. X: When I was lurking through it, I actually wanted the thread to be closed soon. Mostly because of the "Let's get to page X000 before X happens!" posts. I even laughed at what the mods said about how the thread devolved into bragging about page counts, as if that shows quality. Anyway, back to amour, yes I saw Serena blushed. But I'll take it as embarrassment than an infatuation kind of sort. Y: To be fair though, I'm sure if I looked over some of my old forum posts, I'd think I was a weirdo too. But yeah, definitely some people who take that stuff way too seriously or are watching the wrong show if that's what they are after. When this forum settles down, we can start cleaning this topic up from our Off Topic posts. Right now, we won't do anything about it because there is too much drama to handle. We have less than 50 Days until the Fabled Episode guys, what are you most excited about? I haven't seen XY53 yet as I'm waiting for the english dub. Has there been any hints or anything that would be something interesting between Ash and Serena? @Serena wrote: I haven't seen XY53 yet as I'm waiting for the english dub. Has there been any hints or anything that would be something interesting between Ash and Serena? I just watched the episode. There seems to be more in the dialogues (shippy dialogues) than what we see alone. Like BloodRed said, Serena says, "Ash said..never give up til' the end" or something like that when Pancham and Fennekin perform a failed move in the training. Apart from that, there's a little more. All in all, Ash was very supportive. He was the only one who said, "Gambateh Serena!" when the race was about to begin. But of course, they are slightly smaller hints. We did get significant hints too. I think the English subbed version would be worth waiting for. Meanwhile, the Malamar episode seems fun. Although it beats me why they put so much pains into animating it that much when it is an episode- not a movie. The visuals were insane! It's not surprising that the "Don't give up 'til the end!" saying was quoted here. The writer who did the screenplay for XY053 (Omode) also wrote the screenplay for XY007, which had the summer camp flashback where Ash originally said that. The "Gambatteh, Serena!" is a nice homage to Serena repeatedly saying that to Ash during his gym battle with Korrina. But we're still in the status quo; Ash cares about Serena, but we don't have evidence that he has romantic feelings for her. I don't see what the "significant" hints were. I've finally had the chance to watch the episode...There were cute moments and all (and the episode on the whole definitely brings out the feels), but nothing really jumped out at me as being a major Amour hint. This is making your group look bad, no offense. Does this site need this drama? Relax mate. There's some frustration here about the unceremonious way in which the carpet was pulled under our feet. Anyway, let's get on with the discussions shall we? You reached 1000+ pages isn't that enough? But whatever. 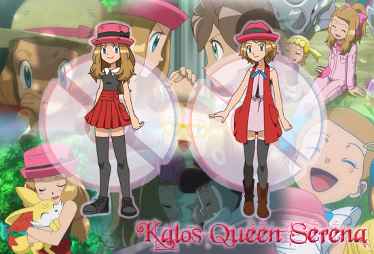 How do you think Amourshipping will be handled in Serena's gen 7 cameo? @AmourMustDie2000 wrote: You reached 1000+ pages isn't that enough? But whatever. From the ashes we will bloom once more. I think it's way too early to speculate on that. We don't know for sure if Serena is going to be replaced at the end of Gen 6. Let's see how AmourShipping is handled in XY059 first - I think that will give us insight into the future of the ship. Welcome to the new SS Amour Pokevision! You were missed! And I agree. it is far too early to speculate on Serena's cameo in Gen 7. We are just about a quarter into the XY saga, and it is futile to discuss anything beyond Laverre City before XY059. We don't know how will Amour be handled, we don't know whether Serena will stay at the end of the saga or not..there are far too many variables at this point. Unknown variables. Also, please don't discuss what's going on in Serebii (though it's incredibly hilarious XD ), since it's off-topic and almost flaming. We have PM's for that. So...don't mind, but I'll have to edit the names at least. As I said, don't do this in public. Hey guys, try to keep the conversation to a minimal and stay on-topic so the discussion can flow. We have a social thread now, so it's much more efficient if you can direct your conversations over there and leave this thread mostly (80% minimum) for discussion. @AmourMustDie2000 wrote: Your Ash avatar is SO COOL! Where is it from? It is fine to ask this, but try to add something in your post that contributes to the discussion. Otherwise, it is much better if you keep these questions to PMs or to the Social/Off topic threads. Right now, the rules may be a little unclear. Please bear with us until the Mods and I get our Announcement Stickies up on each thread. Thank you for your patience. Ok, ok, ok, ok, ok, ok, fine, fine, fine, fine, fine, fine. Relax. No one's talking about this place dude, at least for now. Anyway, about Serena making a cameo in gen 7, as already stated, it's too early to speculate on it. LOL matthew! Watched the episode? What do you think about the hints? Btw, lucky plastered. I am still at work -_- ripping out unused methods from this massive library. Waiting to see your ff! Finally, just watched XY052 and 3. And here are my points. XY052: although Satoshi did shout Serena's name when she fell with Citron, Eureka did shout the latter. And that pretty much works the same the other way around. I don't find it shippy, tbh. Other than that, Satoshi was relieved that everyone was ok, though that's just his general concern for his friends. In short, no hints. XY053: I like how the flashback scenes of younger Serena riding a Meecle touched my heart, seriously. I almost shed a tear then hehe. A shout out to Satoshi's obliviousness getting the better of him. We know that he spotted Serena being uncomfortable with Grace's appearance, but due to Serena's reassurance, Satoshi immediately dismissed it. Argh oh come on! It was a potential scene for hints, and it happened I think 2-3 times in the ep! And just when I was about to jump up and down to celebrate Satoshi's breaking down of his armor of obliviousness. Ah well. I take back what I just said from a few pages. It seems that Serena's blush in the ep was from somewhat embarrassment mixed with appreciation from Satoshi's praise of her tutoring of Sihorn racing. I dunno, it seems I can't put it into words. But... Anyone saw how younger Serena's hair was apparently shorter than it was when she was in the summer camp? I know it's like tied in a pig tail or whatever it's called, but if you take those ties off of her hair, it seems, rather shorter indeed. Maybe she got a hair cut when they were back in Kalos? Just wanna point that out. And yeah, patients is a virtue, dude. In the meantime, imma celebrate my relaxation when I get back to my hometown. Woohoo!! Another traveler joining the trip! "I declare you husband and wife"
Dude, I tell you Serena's not washing that hand which she kept on Ash's mouth, I tell you XD Just you see XD 53 was a good episode indeed!